It could be middle age. But it’s more likely the fact that I’m toting around a body that’s bearing-up under many years of hefty caloric intake and a predisposition for high-fat cheeses. I need to eat better. And if there’s one thing I’ve heard over and over again when it comes to eating “right” it’s this: eat a good breakfast. And by “good breakfast” I don’t think they’re talking about leftover Chinese food. Oatmeal, on the other hand, is a nutritious choice. What’s more, it’s filling, so I’m far less likely to reach for leftover moo shu pork or imported triple-cream cheese come 10 a.m. — four or five hours after I’ve awakened, gotten down to work and had nothing but coffee to keep my body going. That’s organic steel-cut oatmeal ($3.25), slow-cooked in soy milk, topped with brown-sugar crumbles and (my choice) fresh bananas: it was delicious. And apparently, I’m not the only one who loves the stuff. Plus, it had me full-up for the better part of the day and, calorically speaking, clocked in at approximately 300 good-for-me calories — those brown sugar-crumbles notwithstanding. 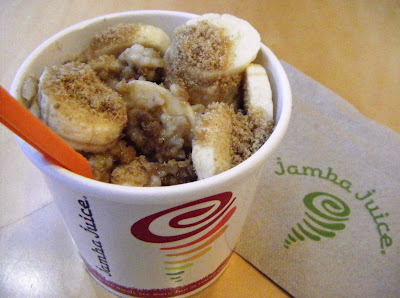 Yesterday, by the way, was my first visit to Jamba Juice, which recently joined in the fast-food-fray, going head-to-head with Starbucks on the oatmeal front — which was news to me since, as I mentioned, I don’t (or at least didn’t) do breakfast. So, any pointers for me as I try to treat my body better? And when it comes to oatmeal — fast or slow, eaten at home or out on the town — what say you?